Moss does prefer shade, but can grow on any side of a tree depending on shading by adjacent flora. Trees in valleys or near mountains don’t get a full day of Sun. This shifts the direction of maximum shade. We are talking about true north here — not the magnetic north indicated by a compass. The animation above simulates the sweep of sunlight across the forest floor in mid-summer at mid-latitudes. The speed-up factor is about 500X. You can see that all sides of the tree receive some sunlight, but the north side only receives sunlight in early morning and late afternoon. Unlike most green plants, moss (division Bryophyta) prefers to avoid direct sunlight and grows best in the shade. That is typically near the north sides of trees, and lower to the ground where the air is more humid. Interestingly, although moss puts down “roots” (technically rhizoids) to anchor itself to the substrate, it absorbs all the nutrients it needs, including water, from the air. Its tiny leaves are often only one cell thick. There is no internal vascular system for water transport. This is why moss prefers shade, and quickly desiccates in sunlight. So yes, IF you can find some trees with moss on them, and IF those trees are fully exposed to sunlight near the base, and IF you have nothing else to go by, then you can get a rough idea of true north by averaging the centers of moss patches over several trees. The graphic above is a composite of three frames from the animation. 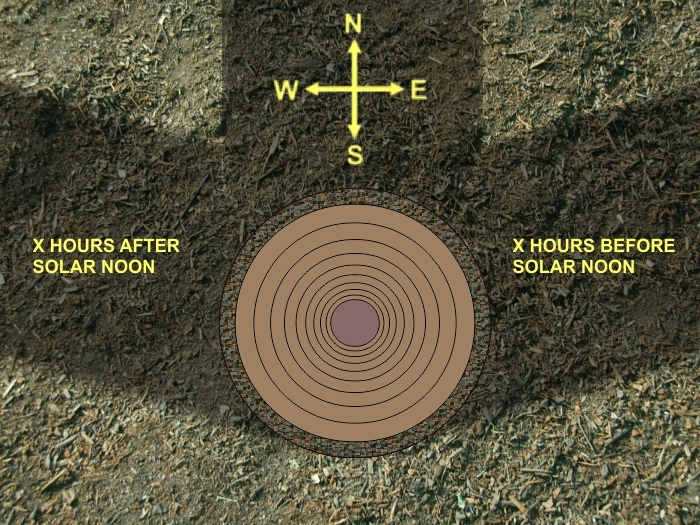 It shows the shadow of the tree trunk at three times: 12:00 – X hr, 12:00, and 12:00 + X hr. The sweep of the shadow is symmetric around 12:00 (noon). At noon the shadow is cast true north. Whatever the value of “X”, the bisector of the angle between the morning and afternoon shadows will also point true north. Of course, this requires multiple measurements over a period of time. Shadows cast by vertical objects stretch long in the early morning and late afternoon. 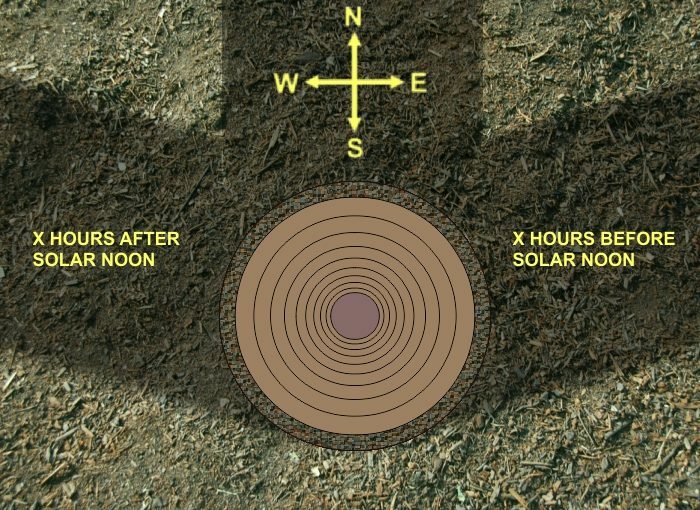 The shortest shadow will be cast at the time of solar noon, when the Sun is highest in the sky at azimuth 180° (true south). And that shadow will be cast in the direction of true north. Watch the shadow of the gnomon in the time-lapse below. North is up. You’ll see the shadow is shortest when it points north. In practice, you’ll first need to find a (reliably) vertical object whose shadow is cast on clear horizontal ground. Short trees that appear reasonably straight are a good bet. Or you could order a Tenderfoot to stand at attention for a few hours. Since you forgot to bring a tape measure as well as your compass, just scratch marks on the ground to record the shadow length every 10 minutes or so. Your measurements must span a period of time from morning to afternoon. If you see the shadow getting shorter over time, congratulations — you started early enough in the day. When you see the shadow getting longer again, you’re done. Find the mark for the shortest shadow and you have found the direction of true north. Do this experiment next time you’re camping and you’ll impress your scoutmaster. Surprisingly, finding north using the Sun is not a requirement for the Orienteering Merit Badge or the Astronomy Merit Badge. In my opinion this is somewhat ironic. The pioneering scouts who guided our country’s Westward Expansion two centuries ago were well-practiced in the methods of celestial navigation. * If you move closer to the equator than 23.5° you are in the Tropics, so sometimes the Sun can be to the north even when it’s noon. This seriously messes with moss growth.